OCaml seemed to lack a decent library for scientific computing. I came across Owl and the official repo and wanted to give it a try. [ERROR] The compilation of conf-openblas failed at "sh -exc cc $CFLAGS test.c -lopenblas". => This package relies on external (system) dependencies that may be missing. `opam depext conf-openblas.0.2.0' may help you find the correct installation for your system. The package comes with a list of examples. 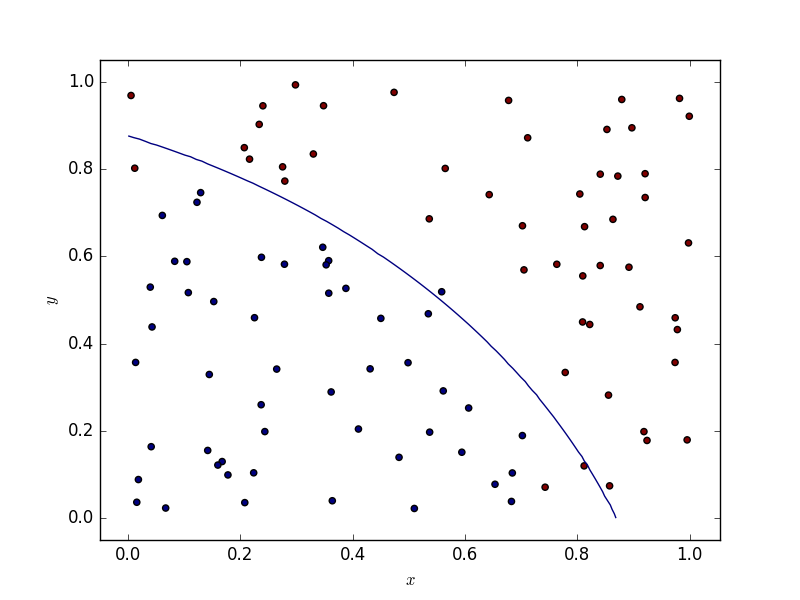 Let’s start with support vector machines! Note that I removed the first line from the actual version of the example below. And produce the following plot (or something similar since the data is generated randomly). A full tutorial can be found here. 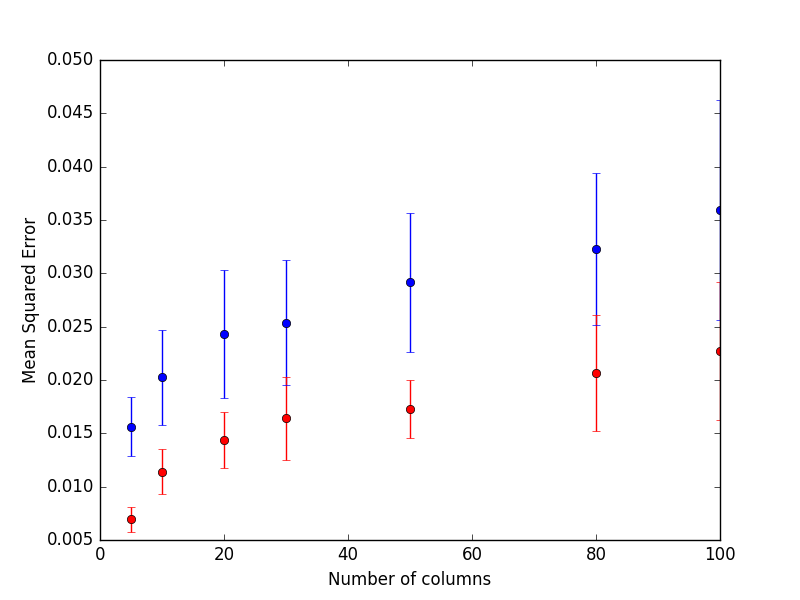 Having used PLplot before, it is indeed much lighter! Playing with matrices, broadcasting operations… is quite easy and the syntax prevents you to substract floats and matrices without knowing it. Which is, from my point of view, a good thing. Let’s implement a simple variance reduction method based on the generation of antitethics random variables (see per example this course). The various operations in Mat. ( ... ) have different meanings. The $- stresses that we are dealing with a float on the left hand side and a matrix on the right hand side, whereas the @= stands for the vertical concatenation of matrices. All the details can be found on the offical website. Given the large number of functions (more than 7000 ! ), Merlin is a must have! Merlin's auto completion. Quite dense! 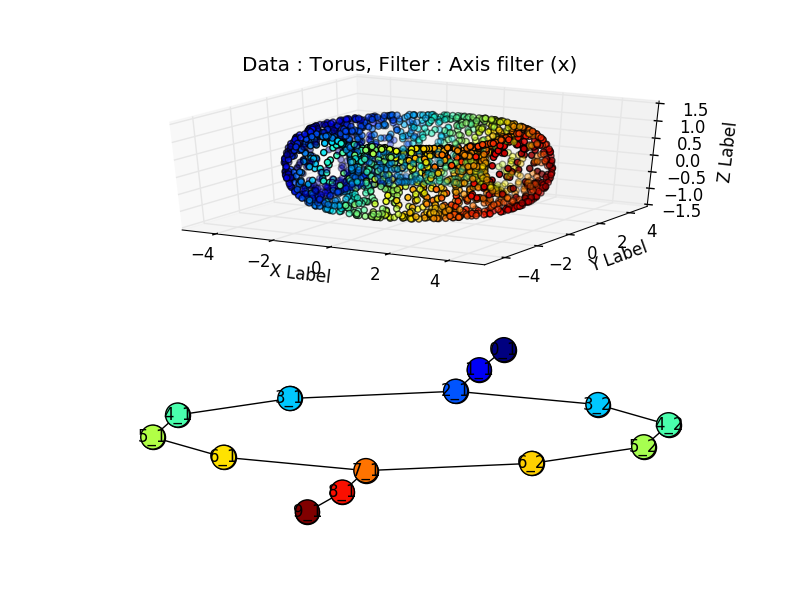 Topological data analysis (TDA) allows to reduce many hypothesis when doing statistics. 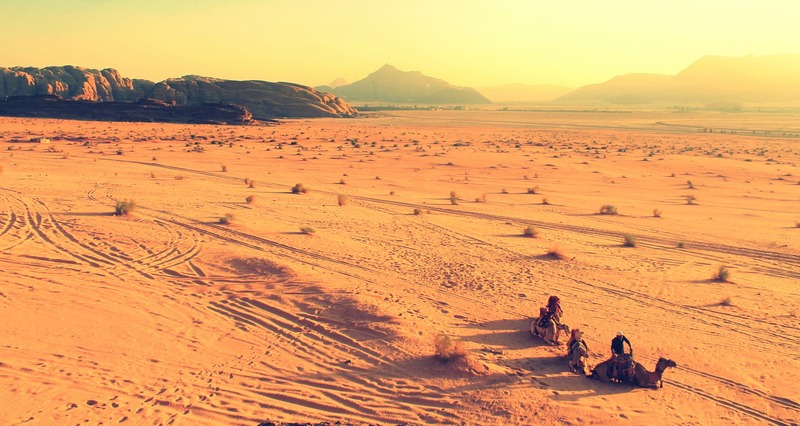 A lot of research in this field has been done over the last years and  and  provide a brilliant exposition about the mathematical concepts behind TDA. Here, I want to focus on one aspect of TDA: compressed representations of shapes. A) A 3D object (hand) represented as a point cloud. B) A filter value is applied to the point cloud and the object is now colored by the values of the filter function. C) The data set is binned into overlapping groups. D) Each bin is clustered and a network is built. Therefore, we will need a “filter function”, a method to cluster a point cloud (the “clusterer”), N intervals and an overlap parameter. Let’s summarize this in the following class. We are now ready to dig in the other concepts. Filter functions allows to associate real valued quantities to the data points. It can be the coordinates of a point on any axis, or the coordinates of the points on the first component of a PCA. 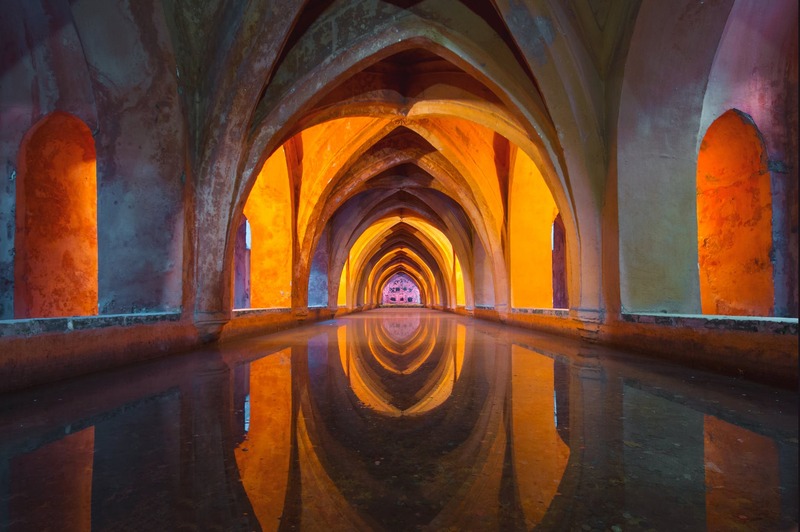 An interesting discovery in this article is the concept of “L-infinity centrality”. This filter allows to associate to a point a real number qualifying how close it is to the boundary of the cloud. L-infinity centrality, is defined for a data point x to be the maximum distance from x to any other data point in the set. 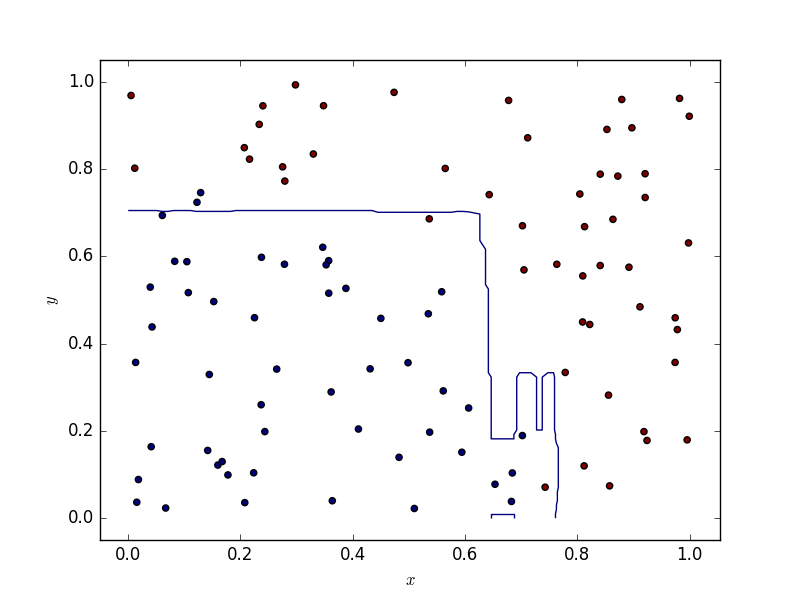 Large values of this function correspond to points that are far from the center of the data set. We first construct the single linkage dendrogram for the data in the bin, and record the threshold values for each transition in the clustering. We select an integer k, and build a k-interval histogram of these transition values. The lustering is performed using the last threshold before the first gap in this histogram. Which can be implemented taking advantage of the implementation of the single linkage proposed in scipy. It is quite easy to sample points uniformly over a sphere (up to numerical precision issues) by sampling an distribution over R^3 which is rotation invariant (here, three independant gaussian with same mean and variance) and normalize it. Uniform sampling over the sphere. I could not find a uniform distribution over the torus, but this should be “uniform enough”. We are now ready to implement the full pipeline and produce sensible graphs. raise "The algorithm has not been trained!" Did it work :) ? 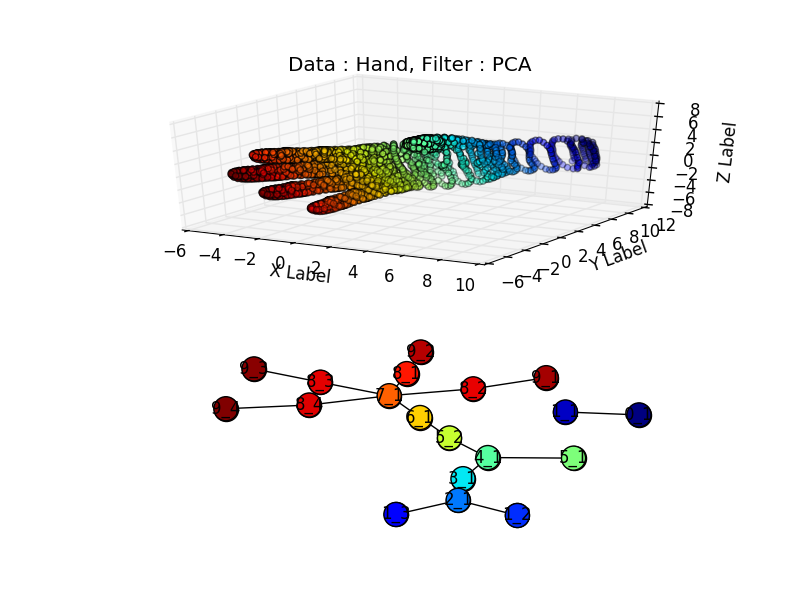 I found a hand data set “Free realistic hand” here, it required a little bit of parsing to put it in a 3d file. Unfortunately the sampling around the wrist is not high enough and the wrist is associated to the two blue dots, separated from the rest of the figure., but we do recognize the four fingers(in red) well separated from the thumb (in green). F. Chazal and B. Michel, “An introduction to Topological Data Analysis: fundamental and practical aspects for data scientists,” arXiv:1710.04019 [cs, math, stat], Oct. 2017. P. Y. Lum et al., “Extracting insights from the shape of complex data using topology,” Scientific Reports, vol. 3, no. 1, Dec. 2013. 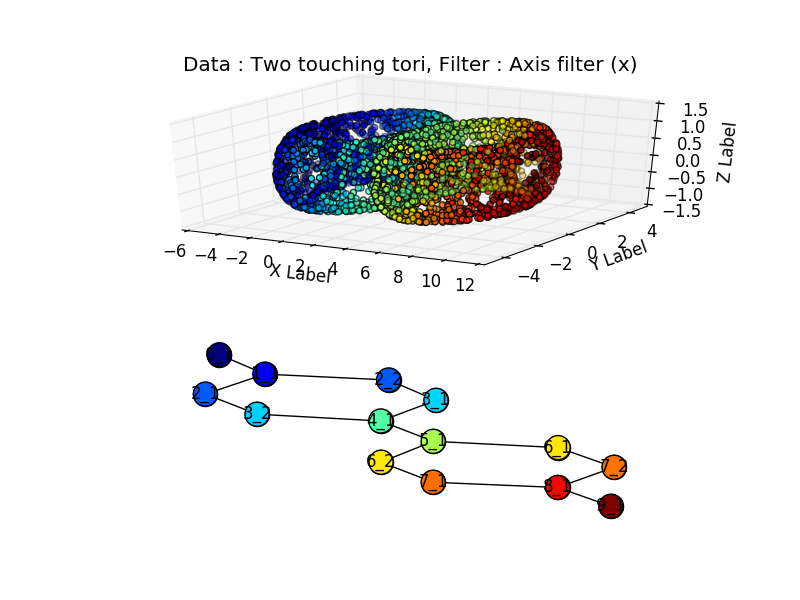 B. Zieliński, M. Lipiński, M. Juda, M. Zeppelzauer, and P. Dłotko, “Persistence Bag-of-Words for Topological Data Analysis,” arXiv:1812.09245 [cs, math, stat], Dec. 2018. A. Zomorodian, “Topological Data Analysis,” p. 39. J. Mathews, S. Nadeem, M. Pouryahya, A. Tannenbaum, and J. O. Deasy, “Topological Data Analysis of PAM50 and 21-Gene Breast Cancer Assays:,” bioRxiv, Nov. 2018. As an occasionnal “Kaggler” I like to write my own code or experiment new alogrithms. This one led me to a top 20 place. The solution was really simple: each line of the train and test set is described as a collection of binary feature. For each feature, one can associate the destinations who share this feature. 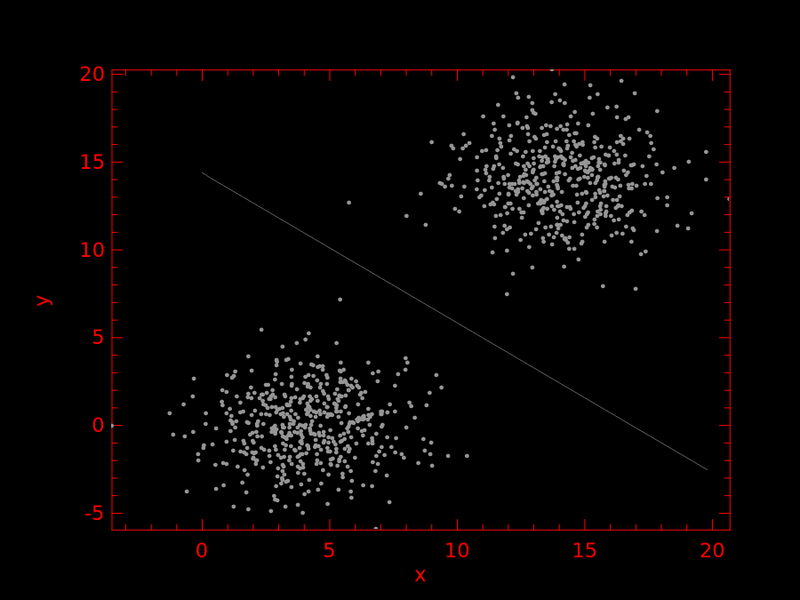 If the cloud of points associated to this binary feature has a low “variance” (i.e. most of the points sharing this feature end up in the same place) and a high number of observations, we want to give a higher weight to this feature. Otherwise, this feature can be deemed as poorly informative and we want to decrease its weight. For the training, cut the trajectories according to a law (it provided a good matching between cross validation and leaderboard score). For each feature (boolean: have this trajectory crossed Ball k, is it id_207?) generate a cloud of points that are the final points sharing this feature. Actually, the cloud itself is never stored in memory (it would not fit on most computers I guess). Only its barycentre and variance are (they are then updated as mean and variance would be). Features and their interactions were considered. Indeed, without interactions the performance is really low. Interactions such as “Is the car on the road to the airport AND is the car going north” intuitively seem much more efficient than the two features taken independently. 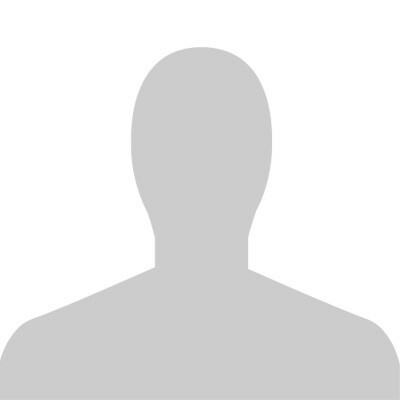 Given the features, gather all the barycenters and variances. , sd and bar stands for the number of points, the variance and the barycenter of the cloud. Using streaming evaluation of mean and standard deviation of a collection of points, this algorithms had a linear complexity in terms of the number of points. The training and testing part could actually be performed in a couple of minutes. Considering interactions of depth 3 ! Unfortunatly, I was limited by my computer’s memory. Combining this with other approaches (genuine random forests…) could have helped as well! Could actually have been made much faster using squares (and rounding) insteads of balls! The algorithm with balls had a complexity ( being the number of balls) whereas rounding would have led to a complexity, no matter the number of squares. The data comes from OpenData.Paris.fr and is inspired from the following kernel. COLNAME = "Geometry X Y"
If you have too many rows (more than 10 000), prefer the random forest. If you do not have much time to pre process the data (and, or have a mix of categorical and numerical features), prefer the random forest. Random forests are inherently mutliclass whereas Support Vector Machines need workarounds to treat multiple classes classification tasks. Usually this consists in building binary classifiers which distinguish (i) between one of the labels and the rest (one-versus-all) or (ii) between every pair of classes (one-versus-one). 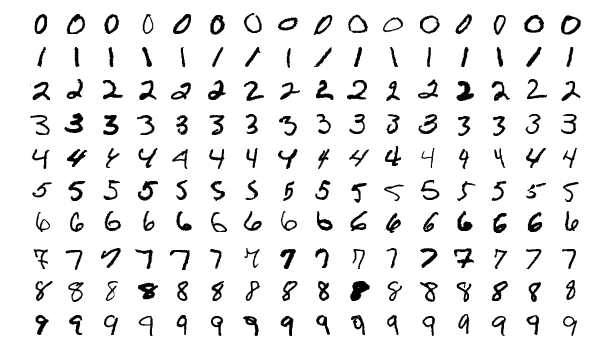 Do we Need Hundreds of Classifiers to Solve Real World Classification Problems? For the sake of the example, the next two paragraphs deal with datasets where SVMs are better than random forests. From crossvalidated, RFs seem to achieve a 2.8% error rate on the MNSIT dataset. On the other hand, on Yann Lecun benchmarks a simple SVM with a gaussian kernel could reach a 1.4% error rate. Virtual SVM could reach 0.56% error rate. We found that both on average and in the majority of microarray datasets, random forests are outperformed by support vector machines both in the settings when no gene selection is performed and when several popular gene selection methods are used. The first thing to consider is the feasability of training a model on a specific data set. Are there too many rows or columns to train a specific model ? Recall the table from the article about time complexity. What we can see is that the computational complexity of Support Vector Machines (SVM) is much higher than for Random Forests (RF). This means that training a SVM will be longer to train than a RF when the size of the training data is higher. This has to be considered when chosing the algorithm. Typically, SVMs tend to become unusable when the number of rows exceeds 20 000. Therefore, random forests should be prefered when the data set grows larger. You can use, however, bagged support vector machines. This simply means that you do not have to worry about scaling / centering data or any other transformation (such as Box Cox) before feeding your data to the random forest algorithm. One scarcely has to deal with two dimensional data. If this ever happens to you, bear in mind that random forest tend to produce decision boundaries which are segements parallel to the x and y axises, whereas SVMs (depending on the kernel) provide smoother boundaries. Below are some illustrations. As I was writing the article, I discovered some recent progresses had been made : a scalable version of the Bayesian SVM has been developed. See : Bayesian Nonlinear Support Vector Machines for Big Data. Wenzel, Florian; Galy-Fajou, Theo; Deutsch, Matthäus; Kloft, Marius (2017). “Bayesian Nonlinear Support Vector Machines for Big Data”. Machine Learning and Knowledge Discovery in Databases (ECML PKDD). Manjaro is amazing. But, it sometimes lacks resources and help to install “common” (it is a matter of point of view) packages. sudo pacman -S rstudio will not be enough, unfortunately. What is exactly yaourt ? Yaourt stands for “Yet Another User Repository Tool”. It is a command line tool for installing packages on Arch Linux. It is a wrapper for Pacman, the shipped package management utility for Arch Linux with extended features and remarkable AUR (Arch Linux User Repository) support. 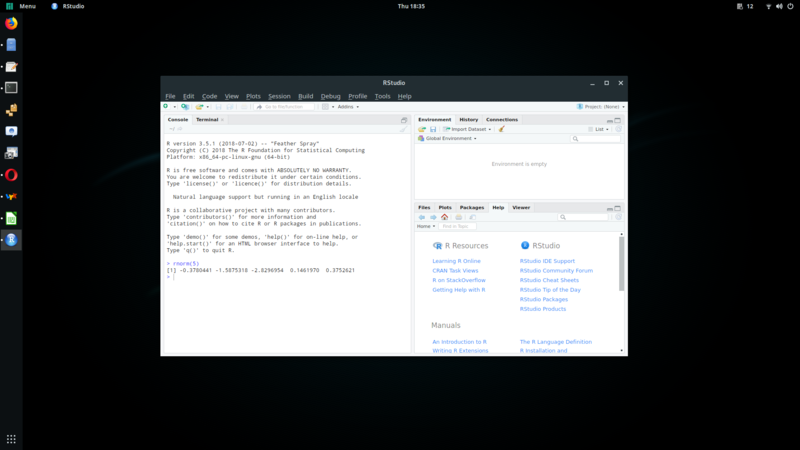 You may find more informations about yaourt (here)[https://archlinux.fr/yaourt-en]. It differs from pacman because pacman will only access what is in the official repos. But the packages created by members of the community which have not (yet) made their way into the official repos can be found on the AUR. Quite some time ago, I asked a question on stats.stackexchange about differences between random forests and extremly random forests. Though the answers were good, I was still lacking some informations. Beyond the nice theoretical arguments, I run some simulations to have a better idea of their behavior. Though these are, by no means, definite conclusions about their respective behaviors, those simulations performed on toy datasets, from specific implementations, I hope they will provide more insights to the reader! Extra trees seem much faster (about three times) than the random forest method (at, least, in scikit-learn implementation). This is consistent with the theoretical construction of the two learners. When all the variables are relevant, both methods seem to achieve the same performance. A decision tree is usually trained by recursively splitting the data. Each split is chosen according to an information criterion which is maximized (or minimized) by one of the “splitters”. These splitter usually take the form of x[i]>t were t is a threshold and x[i] indicates the i-th component of an observation. Decision trees, being prone to overfit, have been transformed to random forests by training many trees over various subsamples of the data (in terms of both observations and predictors used to train them). The main difference between random forests and extra trees (usually called extreme random forests) lies in the fact that, instead of computing the locally optimal feature/split combination (for the random forest), for each feature under consideration, a random value is selected for the split (for the extra trees). This leads to more diversified trees and less splitters to evaluate when training an extremly random forest. The point here is not to be exhaustive, there are more references and the main articles at the bottom of the article. First, let’s observe the timing for each model. I will use the methods implemented in scikit-learn and I will reuse a code seen in another post (the code with new minor updates is at the bottom of the post). Without a detailed analysis, it seems that Extra Trees are three times faster than the random forest method. Now, let’s try to see how they compare when we add irrelevant variables. First, we need to propose a data set where there is something to learn (as opposed as what was previously done). 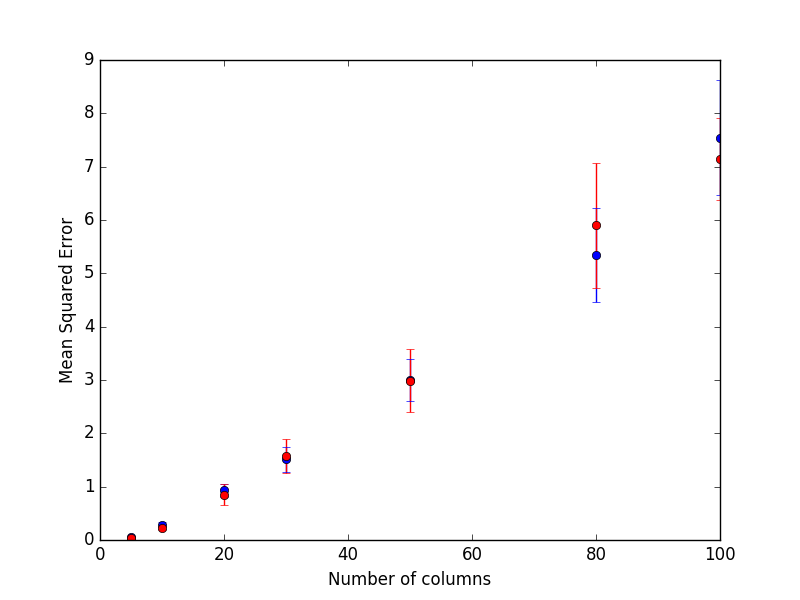 In blue are presented the results from the random forest and red for the extra trees. The results are quite striking: Extra Trees perform consistently better when there are a few relevant predictors and many noisy ones. It seems that both methods perform equally in presence of many relevant features. I will come back to stacking in another post some day, which I also use for cross-validation (stacking can be obtained almost for free during a cross validation). Plus the naming of some functions is quite unfortunate (RunSparse() should probably be called RunNumpyArray() or something like this, likewise, the Run() should probably be RunPandas()…). The code is here for the sake of completeness. Breiman L (2001). “Random Forests”. Machine Learning. 45 (1): 5–32.